In Boulder, Colorado, local cattle have developed immunity against the poisonous larkspur flowers that grow amongst the more edible grasses, making decisions to sell cattle a tough one. A rancher culling a herd he can’t afford to feed faces a problem restocking once economics improve, the replacements may die if they binge on the larkspur. Replacement cattle will cost ranchers more per head as the price rises from the rock-bottom lows. The drought has made many cattle operations untenable since it has pressured ranchers to sell breeding cattle, take on more debt, or seek supplemental work off the farm. In Texas, many ranchers liquidated whole ranches. The drought has killed off much of the natural forage on grazing pastures, forcing ranchers to buy hay, straw, and soybean supplements. Many ranchers are struggling to adapt to the new reality of climate change, or make themselves more resilient to the upcoming vicissitudes. In a survey conducted last year in Colorado, one-quarter of respondents said they would likely leave the industry if the drought persisted into this year. The number was higher, 36%, among ranching operations that included livestock and irrigated farming. Some ranchers are retiring early, selling off their ranches, or leasing them, though not in noticeably large numbers. Most sales are from recreation ranches owned by wealthy families, rather than working cattle ranches. 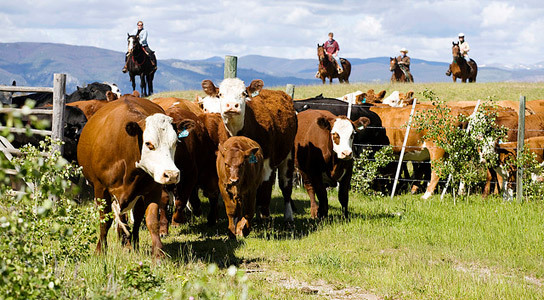 Most of the third- or fourth-generation ranchers are reducing herds. US cattle inventories have sunk to their lowest since 1952 last year, according to the US Department of Agriculture. This year’s drought is more extensive than any since the 1950s, affecting 80% of agricultural land in the US. The USDA has designated 2,186 counties in 41 states as disaster areas due to the drought. Some ranchers are diversifying, offering hunting and fishing tours, or opening event centers. Some ranchers are trying to grow new crops, like soybeans, in an effort to cut down on chemicals that keep weeds in check. Others are trying to fill product niches of high-end local beef. 2 Comments on "Ranchers in the USA Are Struggling to Adapt to Climate Change"
Unfortunately ranchers are having a terrible time because of the drought, but it is also hitting farmers hard too. Most of these farmers and ranchers are probably staunch Republicans. They fully support the Republican party and it its energy plans to burn more carbon based fuels that is adding to global warming. It is ironic that the farmer and ranchers are amongst the first to see the effect of global warming but still support the people who deny it. Maybe the drought will finally break during this winter, I sure hope so. It has been very dry and warm where I live on the Great Plains. The drought is causing the price of food to rise and will effect everyone.